Springfield bed and breakfast travel guide for romantic, historic and adventure b&b's. 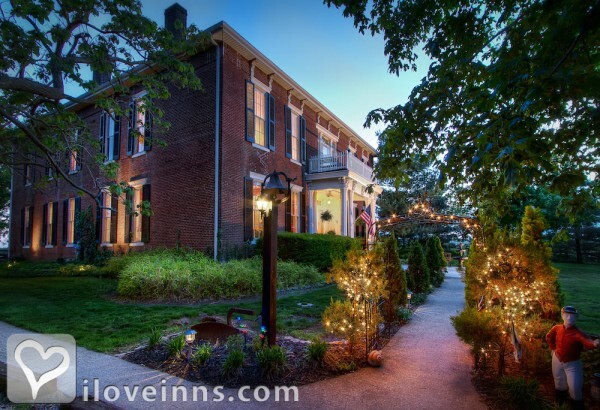 Browse through the iLoveInns.com database of Springfield, Kentucky bed and breakfasts and country inns to find detailed listings that include room rates, special deals and area activities. You can click on the 'check rates and availability' button to contact the innkeeper. Where the Lincoln Legacy Began!Come travel the newly designated Lincoln Heritage National Scenic Byway (US-31E/US-150) to historic downtown Springfield, KY established 1793, where Abraham Lincoln's parents wed in 1806 in the Beechland area near Lincoln Homestead State Park. Experience Lincoln family and Civil War history in the 1816 Courthouse Lincoln Ancestral Museum (opening late summer). Enjoy a walk across the street to see By 1851 Historic Maple Hill Manor B&B. Springfield, Kentucky is a town rich in history and tradition. It is the seat of Washington County, the first county formed after Kentucky became a state in 1792. Nestled in the historic bluegrass region of Kentucky, Springfield is located between I-65 and I-75, and just south of I-64, and both the Bluegrass Parkway and Cumberland Parkway are nearby. Springfield is the home of St. Catharine College and the Washington County Courthouse, the oldest courthouse in Kentucky that is still active and open to the public. By 1851 Historic Maple Hill Manor B&B. Voted one of the top places to stay on the Kentucky Bourbon Trail. Centrally located on the trail, offers FREE toru tickets for 3+ night stays. Contacts with several transportation options, will gladly arrange for your trail excursions. 18+ year experience hosting Bourbon Fans. Springfield, KY is very centrally located on the Bourbon Trail, also features Abraham Lincoln Legacy Museum, Phil Simms Football Museum, and Lincoln Homestead State Park and Golf Course (discount tickets available). Let us make your visit to the area memorable and stress-free with your planning. We look forward to having you as our Guests! Todd Allen, Owner/Innkeeper, Maple Hill Manor, 859.336.3075, www.maplehillmanor.com By 1851 Historic Maple Hill Manor B&B. Bourbon Trail, Lincoln Homestead State Park and Golf Course, National Lincoln Scenic Heritage Byway, Wineries are all nearby Springfield. By 1851 Historic Maple Hill Manor B&B.